Anthony Toth’s home in California holds a hidden treasure unknown to most of the world. From the outside, his garage looks like any garage – but step inside and you are transported back in time to a first class Pan Am Boeing 747 cabin, circa 1979. Anthony, who works as a global sales director for United Airlines has had a lifetime dream of creating his childhood past traveling around Europe with Pan American airlines. 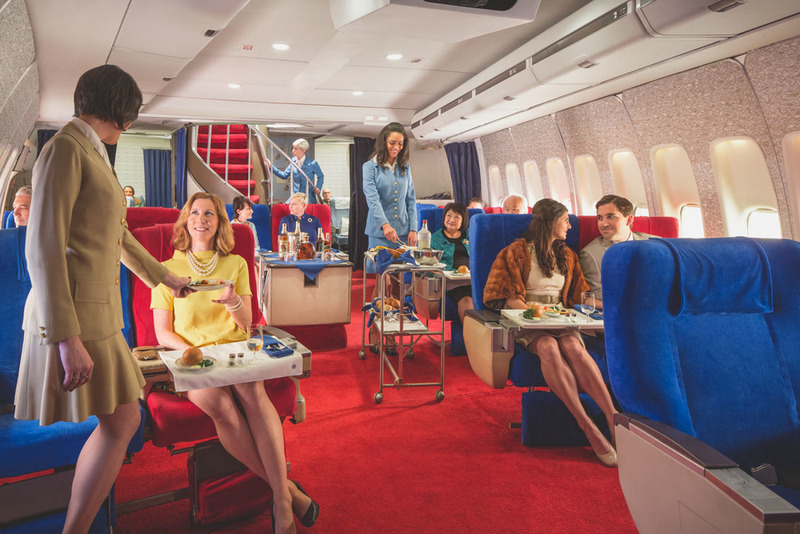 He has spent 20 years and well over $50,000 to recreate his Pan Am cabin in great detail. Everything from the overhead bins, to the seat covers, to the inflight magazines and safety cards, are all period. Even the curved staircase leading up to the upper deck of the 747 is there. Anthony eventually outgrew his garage and instead leased a warehouse big enough to fit a much bigger version of the cabin, including the upper first class lounge of the 747. To help him recreate all the details and features, Anthony uses thousands of reference photos, taken by him self on his travels back in the 1970s and 1980s. While most kids are intrigued to go and see the cockpit in-flight, Anthony spent his time taking photos of the cabins. Everything from the galleys, seats, lights, color schemes etc. To source everything needed for his very own cabin, Anthony frequently visits a airplane scrapyard in California where he can strips the parts of a disused Boeing 747-200 to get anything needed to perfect his time traveling experience. Mr. Toth hopes that he will one day in a near future be able to turn his cabin and Pan Am collection into a museum, open to the public. I for one, would love to experience all of this in person. So, who wants to go to California with me? Ps. For some great Boeing 747 in-flight tunes, get Space Age Lounge volume 3 and Eastern Airlines’ jingles featuring Astrud Gilberto.